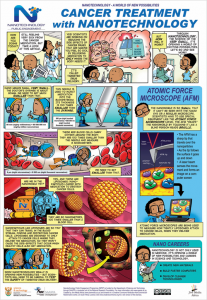 A set of cartoon posters on the possibilities of nanotechnology. Poster topics include water purification, cancer treatment, and energy. 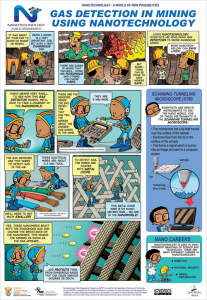 A learner handbook with classroom lessons and worksheets accompanies the posters. 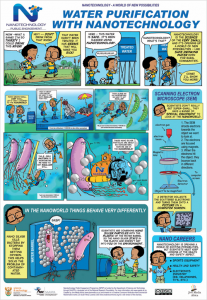 A cartoon poster about how water can be purified using nanotechnology. Scientists make tiny silver particles, called nano silver. These are used to clean water because they are antibiotics. This means that they kill bacteria, such as E.coli, which causes diseases and sometimes death. You can get plastic water barrels that contain nano silver particles. The nano silver particles combine with the cell walls of the bacteria, and stop them from getting oxygen. In other words, they suffocate the bacteria. If you leave water in the barrel for a few hours, all the harmful bacteria will be killed. Nanotechnology can be used to create medicine particles that are small enough to be used to fight cancer. Scientists have designed liposomes so that they carry chemotherapy drugs along the bloodstream and become attached to cancer cells. They can unload these drugs into the cancerous tumours. The chemotherapy drugs can then destroy the tumour, but the rest of the body is not affected by the drugs. This is called targeted drug delivery. Solar panels are made up of many layers. Some of these layers are made from carbon nanotubes. The carbon nanotubes are tiny tubes that are made from carbon. 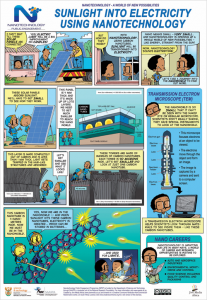 When the carbon nanotubes absorb sunlight, they convert it into electrical energy. This electrical energy can be stored in batteries, and can be used to supply electricity to people’s homes. Scientists have found a way of making these solar panels that is just like painting or printing on a piece of paper. So instead of the old heavy, expensive solar panels, they are now much cheaper and lighter, so they are easier to install. One of the ways that scientists are using nanotechnology to make mining safer is by building gas detectors that can pick up dangerous gases. These detectors are like small noses that can pick up exactly what gases are in the air, and how much of these gases there are. The sensors are built from tiny wires, called nanowires. These nanowires are made out of materials called metal oxides. When the wires made from metal oxides come into contact with different gases, this changes the resistance of the wires. This means that their ability to conduct electricity changes. This change in electrical conduction is picked up by a detector, which gives a warning to the miners about the kind of gas that has been detected. Because nanotechnology uses very small amounts of material, the gas sensors can be made very small, so that they can easily be carried around by miners.